2.6 Why use a Proxy? Hudson is a continuous integration (CI) tool. 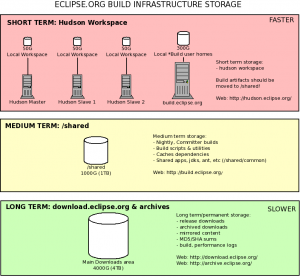 The Hudson project is hosted at Eclipse.org, and is in use on Eclipse servers for Eclipse projects as part of the Common Build Infrastrure (CBI). This page is about the hosted service at Eclipse.org. For more information on the project itself, or to download Hudson, please see the Hudson project page. The Eclipse Hudson server, hosted at https://hudson.eclipse.org/ allows for the execution of Continuous Integration Builds, Nightly Builds, Integration Builds, Release Builds, and Testing (unit and UI). Hudson is maintained by the Eclipse Webmasters. The Hudson Sandbox is deprecated, and will be eventually shut down. Both Shared and HIPP Hudson setups use SLES 11 x86_64 machines for Linux slaves. Windows 7 and Mac OS X slaves are available for UI testing on the Shared instance. These servers are behind a firewall so any outbound http(s) connections are proxied. Each node also has a .m2/settings.xml file with the proxy data. HIPP instances are recommended for those projects who prefer flexibility and convenience with their CI system, perhaps at the expense of security and webmaster support. A single Linux master is provided, and the instance is run under the security context of your project. Optionally, a project's Hudson instance can be configured to write into a project's downloads area and can be given write access to the code repository for automatic tagging of builds. Webmasters will install most plugins you request, including the Gerrit plugin, but will offer little support. In time, projects will be offered self-serve restarts and re-imaging of their instances. Please file a bug against Eclipse Foundation > Community > Hudson to request your project's own instance. Please ensure your project lead can +1 the request. Please specify if you would like to use the Gerrit Trigger plugin, and if you wish to grant write access to your download and code repositories. PLEASE NOTE: there may be security issues related to using the Gerrit plugin. PLEASE NOTE: there may be security issues related to allowing the CI system to write directly to your code repos and downloads area. PLEASE NOTE: if you request plugins other than those available on the Shared instance, webmaster may not be able to help troubleshoot any issues that you may encounter with your instance. The Shared instance is recommended for general purpose builds and tests, and for all UI tests. Shared Hudson has several build slaves, a limited yet stable tool set, and full webmaster support. Shared Hudson cannot write into your downloads area or tag releases in your Git repo. Furthermore, the Gerrit trigger plugin is not permitted to run here. hudson-slave1, hudson-slave2, hudson-slave4 and hudson-slave6 - these are the main build nodes for Hudson jobs. You can specify them by name or by using the 'build2' label. hudson-slave5 - this is an ia64 slave. hudson-slave7, hudson-slave8 - these are ppc64 slaves located at OSUOSL. fastlane - this slave is intended for usage during a release train crunch when re-spins may require more capacity than hudson-slave1&2 can provide. By default jobs should not run here. hudson-perf1-tests - this slave is used for running performance tests ONLY. mac-tests and windows7tests - these 2 slaves are meant for running UI tests for their respective OS versions. By default jobs should not run on either slave. Three tiers of storage are available for storing Workspaces, build artifacts, nightly and release builds. For optimal build performance and service availability, it is important that you use each storage device according to its intended purpose. The image on the right illustrates the three storage tiers and their intended purpose. Each Hudson instance has unrestricted access to the Internet by using proxy.eclipse.org. The shell environment variables below are set for the Hudson build user. If your build process overrides, or bypasses these variables, you must instruct your tools to use the proxy service to access external sites. JAVA_ARGS="-Dhttp.proxyHost=proxy.eclipse.org -Dhttp.proxyPort=9898 -Dhttps.proxyHost=proxy.eclipse.org -Dhttps.proxyPort=9898 -Dhttp.nonProxyHosts=*.eclipse.org -Dhttps.nonProxyHosts=*.eclipse.org -Dftp.proxyHost=proxy.eclipse.org -Dftp.proxyPort=9898 -Dftp.nonProxyHosts=*.eclipse.org"
JVM_OPTS="-Dhttp.proxyHost=proxy.eclipse.org -Dhttp.proxyPort=9898 -Dhttps.proxyHost=proxy.eclipse.org -Dhttps.proxyPort=9898 -DhttpnonProxyHosts=*.eclipse.org -DhttpsnonProxyHosts=*.eclipse.org -Dftp.proxyHost=proxy.eclipse.org -Dftp.proxyPort=9898 -DftpnonProxyHosts=*.eclipse.org"
ANT_ARGS="-Dhttp.proxyHost=proxy.eclipse.org -Dhttp.proxyPort=9898 -Dhttps.proxyHost=proxy.eclipse.org -Dhttps.proxyPort=9898 -DhttpnonProxyHosts=*.eclipse.org -DhttpsnonProxyHosts=*.eclipse.org -Dftp.proxyHost=proxy.eclipse.org -Dftp.proxyPort=9898 -DftpnonProxyHosts=*.eclipse.org"
ANT_OPTS="-Dhttp.proxyHost=proxy.eclipse.org -Dhttp.proxyPort=9898 -Dhttps.proxyHost=proxy.eclipse.org -Dhttps.proxyPort=9898 -DhttpnonProxyHosts=*.eclipse.org -DhttpsnonProxyHosts=*.eclipse.org -Dftp.proxyHost=proxy.eclipse.org -Dftp.proxyPort=9898 -DftpnonProxyHosts=*.eclipse.org"
The Eclipse Hudson environment is expected to grow to a large number of slaves for builds and for tests. If each of those slaves requires a routable IP address, the Foundaton will be required to acquire (at cost) additional IP blocks, which further complicates routing and firewall setups. A proxy will allow us to track and monitor external dependencies that are downloaded at build time, for IP purposes. A proxy will enable us to implement caching at the proxy level, should the CI mechanism begin to download the entire world and consume too much bandwidth. The p2 director does not respect the "http.proxyHost" etc. options passed in on command line. But, since the p2 director is an Eclipse application, one way to configure the proxy settings is to set the configuration file configuration/.settings/org.eclipse.core.net.prefs in the director installation as below. [Note: this are roughly accurate as of 03/15/2013. They may change from time to time, over the years, so if they don't seem to work, contact the webmasters to ask if they have changed or differ for different machines.] Notice this example has "systemProxiesEnabled" set to true. This is because on Hudson, from time to time, the webmasters may change the proxy configuration for each slave differently, so if you can take advantage of the system-set proxies, you will be better off. If not, the provided values will apply if you set "systemProxiesEnabled" to false. Also note that the "socks proxy" should not be set in Eclipse, unless you know for sure you have a true socks proxy, or else all traffic will be routed through that, so if its not a true socks-level proxy none of the others will work. The proxy for Hudson is not a socks proxy, just HTTP, HTTPS, and FTP protocols. Also note, a full "Eclipse Platform", where native providers are provided, such as on Windows, will automatically detect and fill-in the system proxies. But, this auto-detection won't work if you have a "bare" p2-director app or something like the platform's "basebuilder"; in which case you must provide them with a script such as the following. See bug 401964 for some discussion of these issues, among many other network and infrastructure issues. The easiest way to obtain this file is to configure an Eclipse installation on your own computer (in Eclipse, go to Window > Preferences > General > Network Connections), and then copy the configuration that Eclipse wrote in <eclipse>/configuration/.settings/org.eclipse.core.net.prefs. On the Windows operating system, proxy settings (and exceptions to using the proxy) can be set in "Internet Options". These are "detected" by Eclipse and set in "native" values of proxy preferences, but, apparently, from searching eclipse bugs for "proxies", some functions in Eclipse use these preferences and others do not. In any case, you might HAVE to set the Windows Internet Options proxy exceptions and in some cases it might make things easier. (For one case of details/history, see bug bug 372880. Buckminster cvs materializing, uses a proxy, how is this configured? But I saw that the CDO build is green again and they still do an Ant call from Hudson that again triggers Buckminster. Previously that build failed with the same exception as ours did or do. Build in Hudson - Information on requesting jobs, running jobs, setting up builds. What is the Test-Slave Node? How do I use the Test Slave Node to run Tests?